Native American Indians were a deeply spiritual people and they communicated their history, thoughts, ideas and dreams from generation to generation through Symbols and Signs such as the Star symbol. Native American symbols are geometric portrayals of celestial bodies, natural phenomena and animal designs. For additional information on this subject refer to Star Chart & Astrology. Winter counts are pictorial calendars or histories in which tribal records and events were recorded in picture writing naming each year (winter) by an outstanding event. Many of the Plains tribes including the Lakota Sioux, Blackfoot, Mandan and Kiowa used winter counts extensively. 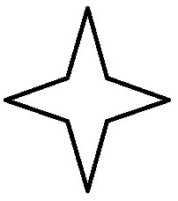 The Star symbol was used to produce a picture records. The star symbol was used to describe a famous event that occurred in 1833 - which we call the Leonid meteor shower. This fantastic meteoric display took place on the morning of November 13, 1833 and was was witnessed throughout North America. This event was recorded in several Native American Winter Counts - using the star symbol to predict the event. The stars are represented having four points. The event was recorded using the star symbol by four tribes referring to the event as the 'Year the stars fell'.